Use our video to better understand earthquakes. Teachers, scroll down for a quick list of key resources in our Teachers’ Toolkit, including today’s simple MapMaker Interactive map. CLICK TO ENLARGE! The Earthquake Hazards Program, from the good folks at the USGS, puts together some of the most efficient, reliable, and visually appealing information out there. In our video “Earthquakes 101,” we learn that most earthquakes are caused by the movement of tectonic plates far below Earth’s surface. What tectonic plates were interacting in the earthquake that struck Iran? Take a look at today’s simple MapMaker Interactive map for some help. The Arabian and Eurasian plates were interacting. How were the plates interacting? Take a look at the classic Nat Geo map of “Earth’s Dynamic Crust” for examples of different types of tectonic activity. Specifically, the Iran quake was the result of “oblique thrust faulting” a complex process that incorporates significant strike-slip faulting (horizontal movement) and normal or reverse faulting (vertical movement, also called dip-slip faulting). Watch this video from the good folks at the Incorporated Research Institutions for Seismology for help. The Iran-Iraq quake is described as having a magnitude of about 7.3. What is magnitude? Is 7.3 a high magnitude? Magnitude is a number that describes the intensity or size of an earthquake. Our “Earthquakes 101” video talks about the Richter scale of magnitude, but seismologists are far more likely to use the moment magnitude scale (MMS or simply M). A 7.3 quake has a very high magnitude. Seismologists qualify this as a major earthquake. Only about 20 quakes of 7.0-7.9 occur each year. 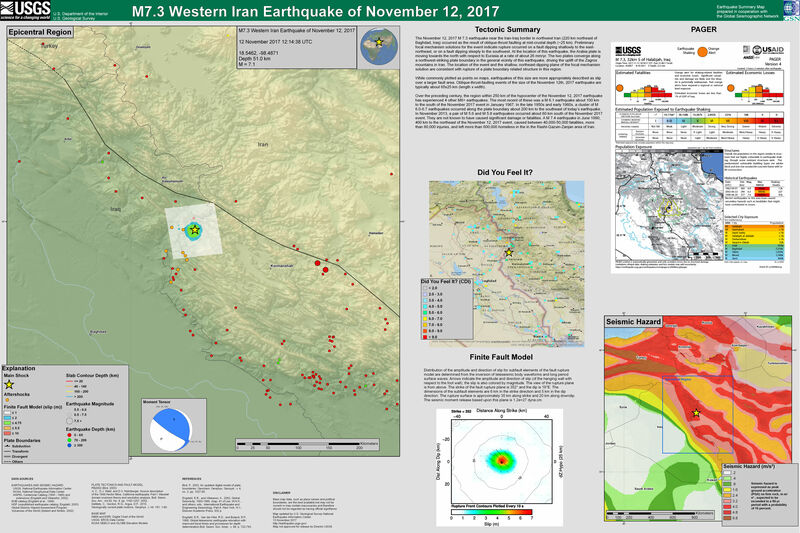 The Iran-Iraq quake is described as having a focal depth of about 25 kilometers (15.5 miles) at its epicenter. What is focal depth? What is an epicenter? Is 25 kilometers a deep or shallow focal depth? The focal depth of an earthquake is how far below the surface of an earthquake’s epicenter the actual rupture, slip, or dip took place. Earthquakes can take place anywhere between one and 700 kilometers below Earth’s surface, so 25 kilometers is a pretty shallow depth. Next Next post: Educator Spotlight: What Happens When Educators See Themselves as Explorers?